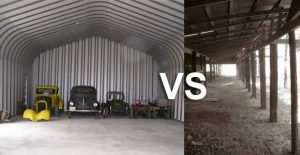 Pole Barn or Steel Barn – Which is Better? A realistic comparison by an unbiased writer and slightly biased graphic artist. If you’re in the market to build a new barn and you’re wondering what is the better choice – steel or wood – there are some real solid benefits to a steel barn that may help you with your decision. In terms of materials, the cheaper option depends on the lumber market. Lumber prices are much more susceptible to price variations than steel prices, which remain relatively constant. Repair and replacements costs will always be higher with wooden pole barns as well just based on the fact that steel will always outlast wood. Steel is one of the strongest building materials in the world. A steel barn withstands even the fiercest weather conditions and you will never have to worry about possible rot or structural shifting due to shrinking that is common with wood. Unlike wooden pole barns, Future Buildings steel barns are truss-free allowing for full use of the interior. The bolt-together arch design of a steel building means you are working without posts, beams or columns taking up valuable space. You will have more room for the likes of livestock, grain or machinery in a Future Buildings steel barn. As Future Buildings steel barns consist of pre-cut, pre-punched steel, you won’t have to be a contractor to get the building up. A properly prepared foundation and a little help from family and friends in your community with some basic DIY skills is all you will need. Most pole barns require skilled erectors to do the job which adds a lot to the overall cost of the project. Once your barn is complete, you can extend it at any time. If you need more space to grow with your farm or business, steel barns are the easiest to expand. By simply adding more arches to the length your barn is bigger. It is a much more costly and labor intensive renovation to expand a wooden barn. A very practical reality to consider is the fact that steel is less combustible than wood, making a Future Buildings steel barn less susceptible to fire damage than a wooden barn. This may be an advantage when it comes to insuring your new barn, so check with your insurance provider to compare the insurance premiums of a steel barn versus a wooden barn. By nature wood ages and cracks as well as warps or swells from the effects of temperature and moisture. A great paint job will require touching up or repainting after a few years of exposure to the elements. A Future Buildings steel barn requires little to no maintenance, inside or out. It is structurally sound, naturally temperature controlled and the protective Galvalume Plus™ coating ensures long term resistance to the damages of rust. 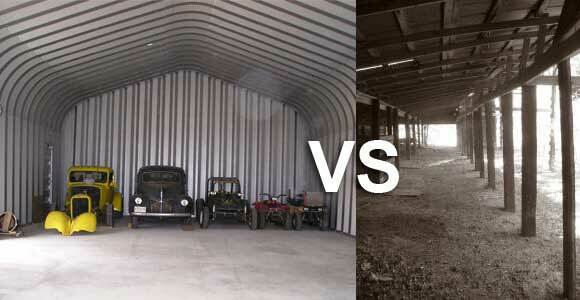 Decade after decade, your steel barn from Future Buildings will look as good as the day you completed it!